Hello. Yes, it's been 18 months, so I thought I'd get an entry in for what's left of 2015. I was listening to the blistering Herbie Hancock rhodes solo in Joe Farrell's fantastic cover of Stevie Wonder's "Too High", and decided to compile some of my favourite Hancock electric piano tracks from other people's albums - so here's a selection from 1968-1978. 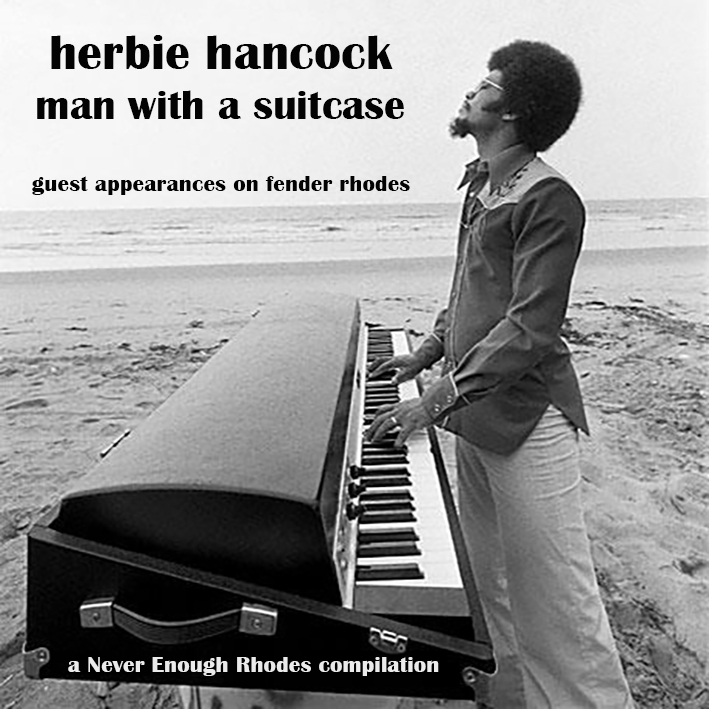 The compilation title refers to the portable "suitcase" Fender Rhodes. Of course, there are endless Miles Davis tracks from this period with Hancock on rhodes, and I didn't want to get bogged down there, but I've included 1968's "Stuff" because you can hear Hancock in transition, using the Rhodes in a raw state, referencing his acoustic piano style while he learns the new instrument. 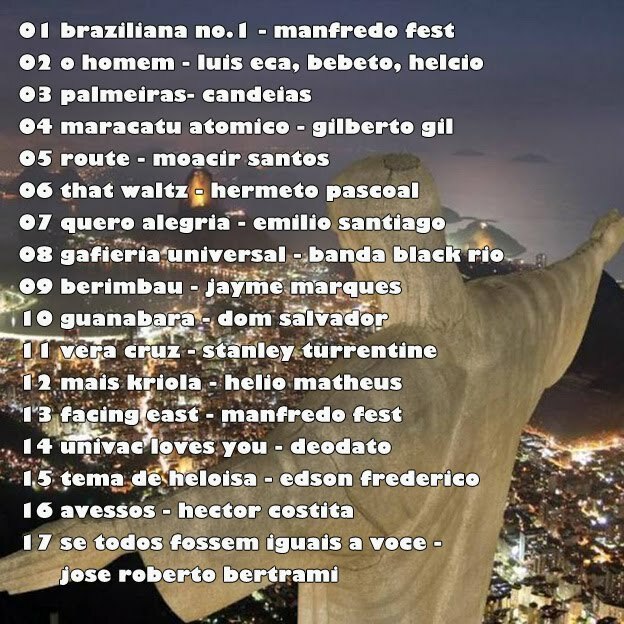 This continues throughout the turn of the decade through tracks like Joe Henderson's "Black Narcissus"; Freddie Hubbard's "Red Clay" and Miroslav Vitouš' "Infinite Search". Within the few few years of the 70s, Hancock''s already developed his clustered chord structures and adjusted the amplification for a punchier, rhythmic style on tracks like Joe Farrell's "Too High" and Milt Jackson's "People Make the world Go Round". He's also exploring the in-built chorus, tremelo, delay and panning effects, and incorporating them in his writing and playing style on tracks like Eddie Henderson's "Scorpio-Libra", and Norman Connors' "Blue"and "Revelation". The latest track here is Quincy Jones' beautifully-orchestrated 1978 version of Hancock's "Tell Me a Bedtime Story". Jones has scored Hancock's rhodes solo from the 1969 original version for strings, then brought Hancock in to create new textures around that arrangement. It seems that Divshare has died, so all of the previews on previous posts are gone, grrrrr .... I'd appreciate any advice about other players I can use - even during the writing of this post, Soundcloud has deleted a few of my preview excerpts because they sensed what they were. I've re-upped all previews on the blog three times now, and I realise that nothing ever lasts. Anyway, I hope you enjoy this 20th rhodes compilation - grab it from the links at the top of the post, and please say hi in the comments below, so I know that I'm not just talking to myself. Well hello, welcome back, it's been a while. First thing I want to say is that I've just re-upped the whole damn blog back to 2008, as some kind soul destroyed my previous upload account. Hell for me, but good for you, so feel free to browse all the way back into the previous decade - it's all there ... for now at least. As always, I love people to comment on the music and say hi, otherwise I may as well just keep it on my computer - so the best way to make me post more than once a year is to chat, and not lurk. This isn't an advertising-run download bonanza site, it's one person sharing music for conversation. 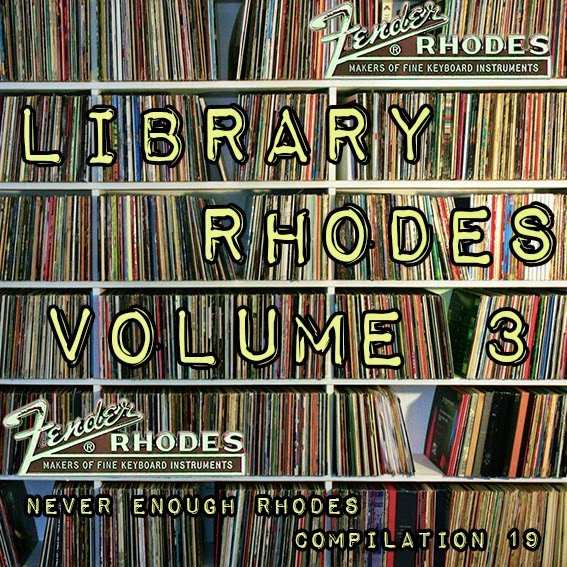 Today's share, Library Rhodes 3, is a new compilation of library music featuring the ol' electric piano in a series of jazz, funk and bossa style tracks. The last two volumes of this - Library Rhodes 1 (2010) and Library Rhodes 2 (2011) - were extremely popular, so I hope you enjoy this one as well. Click the preview players above - they work, but take a few seconds to start. The music comes from a range of library music labels. There are old favourites like KPM, De Wolfe, Themes International and Amphonic - but also a focus today on Italian library : Fonovideo, Music Scene etc, with a particular focus on composer Oscar Rocchi, both under his own name and his alias 'Chiarosi'. In iTunes, you'll find the names of the source albums for each track in the 'comments' column. Enjoy it, explore the blog and have fun. If you like this compilation, check out more rhodes compilations. 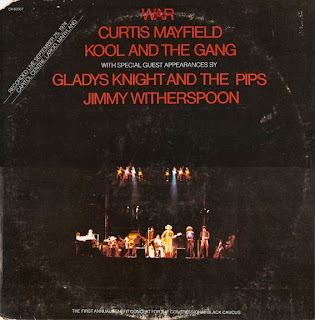 Re-up of this great live funk and soul album, featuring War, Curtis Mayfield, Kool & The Gang and Gladys Knight & The Pips. WAV and MP3 versions, my rip. Go here for previews, info and download links. 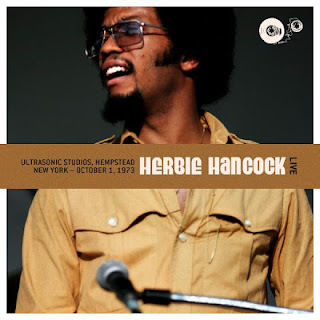 This is just to let you know that I've re-upped the 17 Herbie Hancock concerts from the 1970s at the Herbie Hancock 53 Live Bootlegs post from 2008. Several links there have been replaced with lossless WAV versions as well. Unfortunately I don't have the time to track down all of the post-1981 concert links, which are almost all dead, but contributions would be very welcome. The Ultrasonic Studios concert from 1973 has had more downloads than anything I've ever posted here, it's a great show. 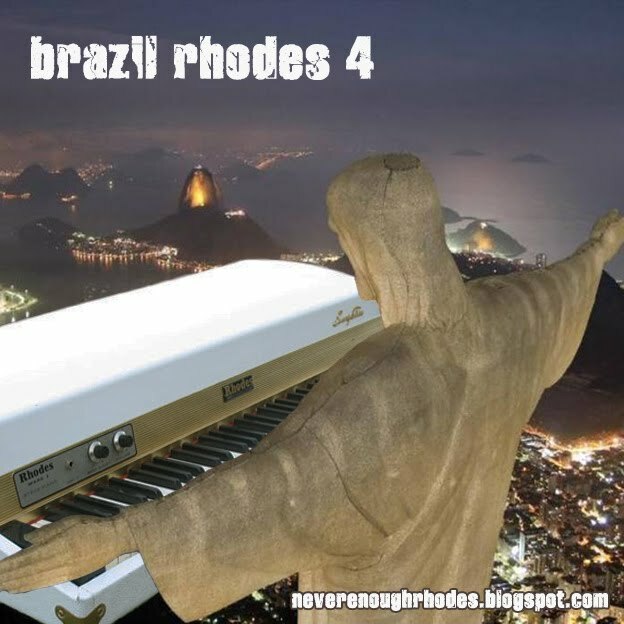 Hi everyone, welcome to the fourth in a series of latin compilations with featured electric piano. Lots of funk, jazz and latin rhythms here, hope you enjoy it, and please say hi in the comments. 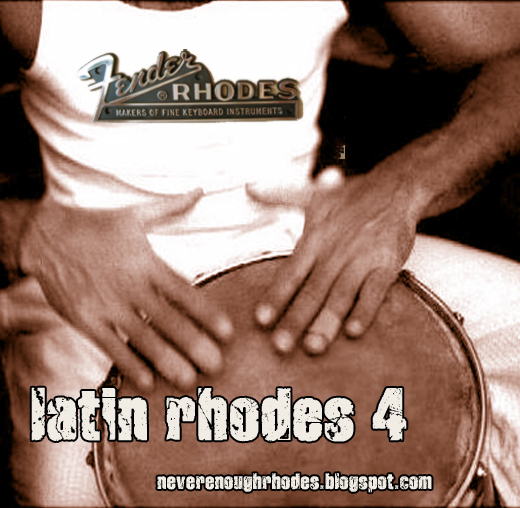 If you enjoy this, you might want to check Latin Rhodes compilations 1, 2 and 3 - or just check out all 18 of the rhodes compilations. Please say hi in the comments and chat so that I feel more encouraged to get back into this more regularly. Hope you enjoy the comp! .... or all 17 rhodes compilations here. 4 x Herbie Hancock on Musik Laden, German TV, 1974 Click here for more Herbie Hancock on this blog. Twenty minutes of live Freddie Hubbard from 1973. There's a rip of Hubbard's 1975 album Polar AC on this blog a few years back here. 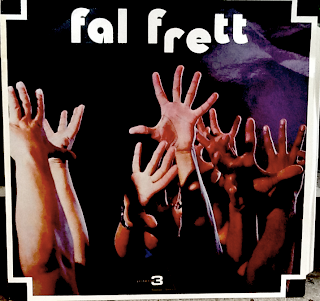 First album from the band "Fal Frett" - you may have seen their second album at The Growing Bin last month. 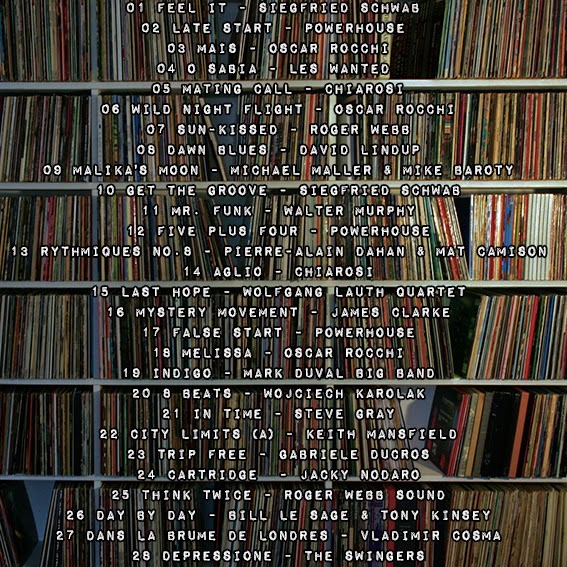 Big thanks to Orangefunk for ripping and donating this album, and please give him some thanks in the comments! "One of the most talented families on the contemporary Martinician musical arena is the Barnards. The grandfather, Armand, was a violinist, and his sons Gaëtan and Parfait continued the tradition : the former was another violinist and the latter, a keyboard player. Raised in a household where music totally surrounded them, it was only natural for Parfait's sons Alex, Jacky and Nicol to love playing instruments. Alex, the oldest and a bass player, is the only full-time musician among the brothers since he quit his job at the Hopital de la Meynard. He studied with Edmond Michalon and, as a bass player, joined the jeunesse Etudiante Catholique (Catholic student youth group), to which other aspiring musicians belonged, such as the pianist Paulo Rosine and the flutist Serge Lossen. In 1969, he joined the Merry Lads, which evolved into Malavoi, and he continues to play with the band today. Furthermore, between the two disbandments of Malavoi in the 1970s, Alex took the opportunity to go on tour in Canada with Marius Cultier. The multiple instrumentalist Jacky, born four years after Alex, commenced playing the piano at age eleven. In 1970, he passed his baccalaureate and left to study law in Paris at the Faculty of Assas. While there he began to perform at Caribbean venues and worked in the recording studios. 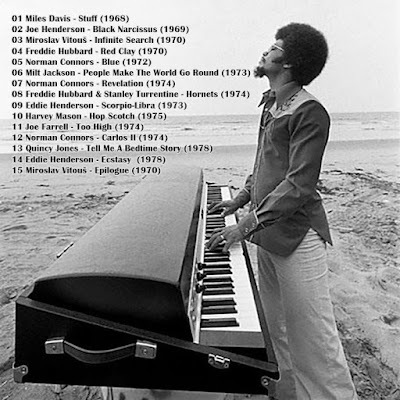 ln 1975, he returned to Martinique where he played the piano and keyboard in piano bars, especially at the Inn of Monsieur Duban in the town of Riviere Salée. Nicol, the youngest of the three, born in 1956, familiarized himself with several instruments, but at age fourteen, he seriously studied the bongos and other percussion with Colette Frantz and eventually with Henri Guédon. Since then Nicol has become known as an accomplished percussionist. In 1969, Nicol participated in a jazz concert with his brothers at the Cercle Martiniquais. Afterward, he left to study in Paris, where he became a member of Guédon’s newly composed Cosmos Zouk. At age nineteen in 1976, he returned to Martinique and agreed with his brothers, Jacky Alpha, and Bid Monville to create Fal Frett. In 1976, Fanny Augiac proposed that Fal Frett should make its debut before the public at the Centre Martiniquais d’Action Culturelle (CMAC). 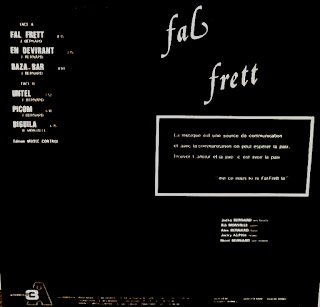 The band’s ﬁrst concert repertoire was taken from its ﬁrst record Fal Frett, which was released by Jacky Nayaradou’s 3A Productions. Afterward, Ralph Thamar and Robin Vautor joined the band, with Jacky Bernard functioning as the leader on the second album In the Wake of the Sunshine. Jacky was responsible for organizing the program so that the music in each set followed harmonic key changes. 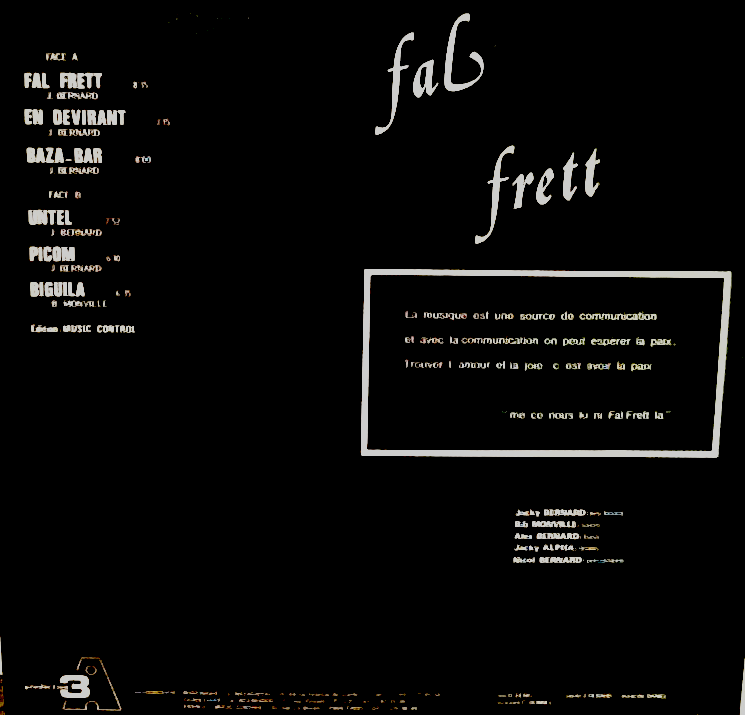 In general, what makes Fal Frett stand out is the band's distinctive sound, which some call jazz fusion. 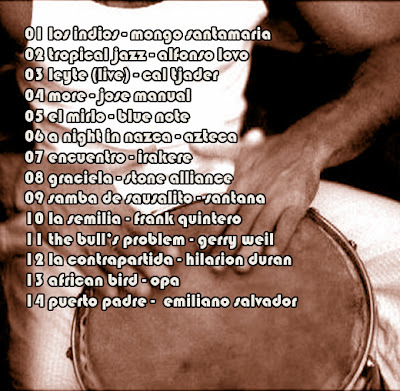 This is in reference to the band’s incorporation of traditional Martinican musical themes and an extension of them along more jazzy lines." 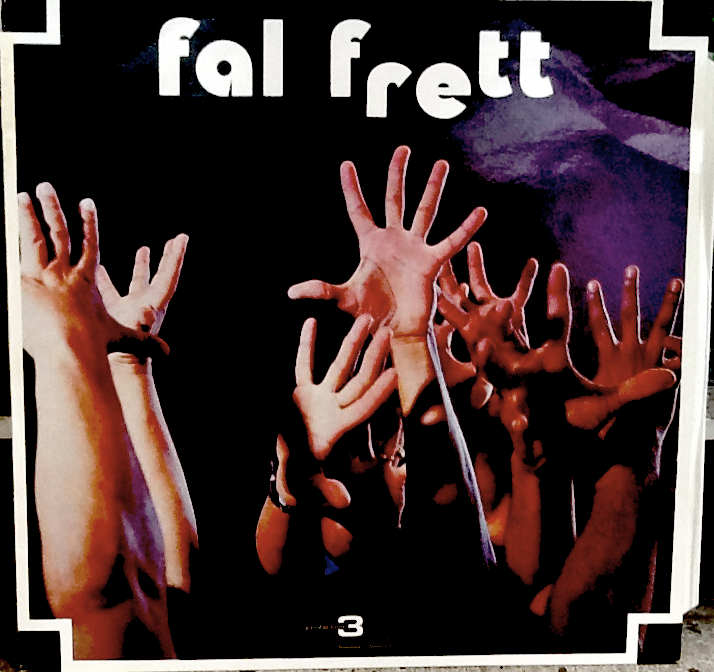 Fal Frett apparently means "the action of being overcome, gripped or stunned by something". 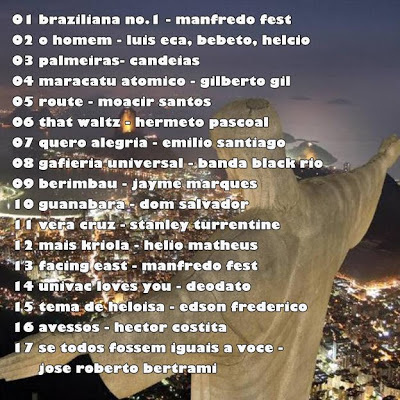 Keyboardist and leader of Brazilian group Azymuth.